The Pro Performance boot series includes these cross country boots and overreach boots which are lightweight but very durable and protective. Photo by Kate Samuels. The market for cross country boots has become very competitive in the past few years, as riders are demanding better protection for their prized partners, and Professional’s Choice has responded with leg care that is backed by research. If I’m buying a boot, I want to meet a certain level of quality and function while not breaking the bank. The Pro Performance XC Boot and the Deluxe Overreach Boot are a really solid combination that fulfills a lot of the criteria for ideal leg protection while competing or schooling at any level. First of all, the boots are incredibly lightweight and breathable, which is advantageous for your horse in a number of ways. 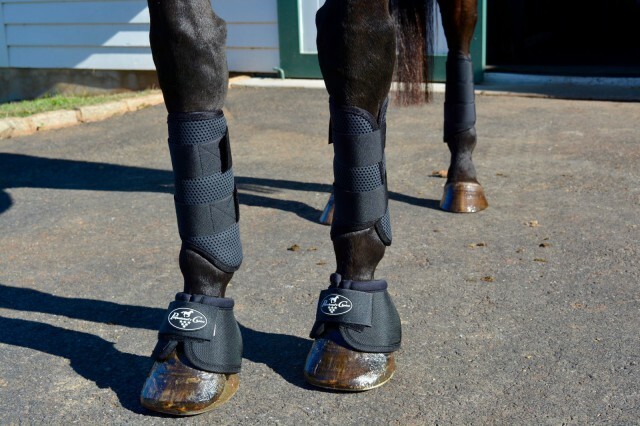 Not only do you not have to worry about weighing down his legs with cumbersome leg shackles while attempting to clear important jumps, but you can also rest easy when wearing the boots for a long time, as they do not significantly heat up the leg. In general, we are trying to avoid making a toasty environment for tendons, especially during exercise, and having worn these on several horses during an Indian summer week, I can say that they are significantly more breathable than your average galloping boot. The rip-stop material of the Pro Performance XC Boots means that they’re lightweight and don’t hold water while you’re riding. Photo by Kate Samuels. 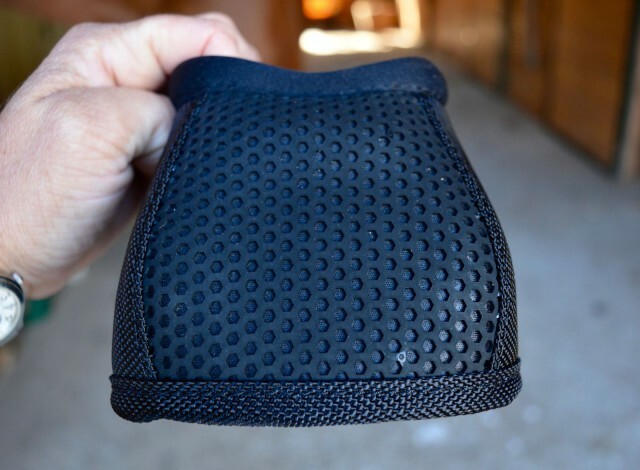 The inside of the boot is soft to the touch, and yet has a non-slip lining that helps to keep the boot from rotating or slipping down while on cross country. I wore the boots through rivers and on long hacks, as well as cross country schooling and even took them to a competition. I found no signs of slipping any which way after usage in a variety of situations. This was particularly impressive as I used them on a horse who has an irregularly shaped leg due to an enormous old splint, and his boot usually gets wonky on that one leg. The Pro Performance XC Boot also features a revolutionary strike guard made from high quality Pebax in both front and hind boots. Pebax is a high end thermoplastic elastomer that is flexible and conforms to the shape of the leg, but is hard and rigid upon impact. 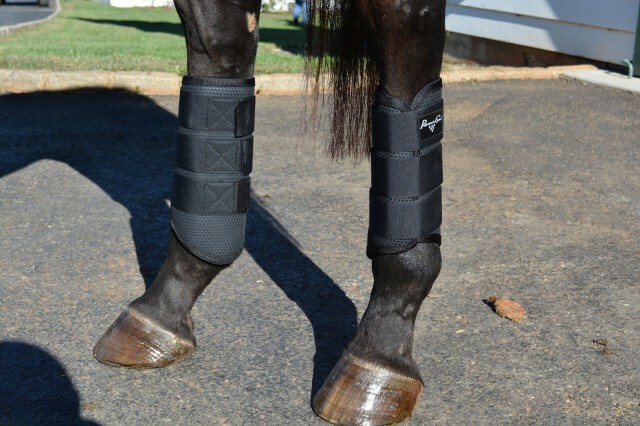 There is a flexible yet protective strike guard that surrounds the back of the front tendons on the front boots, and the front and inside of the hind boots. It is easy to fit them to each horse, and works for differently shaped legs well. The non-slip lining of the Pro Performance XC Boots prevents slipping but also stops any rubs. Photo by Kate Samuels. The outer material of the Pro Performance XC Boots is a layer of Pro Performance TPU material that works to keep the boot durable through heavy use, yet lightweight and breathable. You can see the honeycomb design in the pictures, and while it might look soft and lovely, it is very hard wearing and does not tear when scraped across a log (I unintentionally tried this). This serves as abrasion protection, but also protection for your investment in the boots, as you won’t need to replace them if you have a scrappy moment on cross country. Professional’s Choice Overreach Boots have long been lauded as the cream of the crop for protecting horses that tend to overreach or pull shoes, and now they’ve added a reinforced Pro Mesh strike area to the new Deluxe series. These boots have all the same features as you are accustomed to receiving including a durable ballistic binding around the base of the boot to improve durability, and the soft padded roll around the top that prevents rubbing and provides comfort. The classic no-turn knob inside the boot tucks nicely into the heel of the horse and keeps the boot in position no matter how much they run and jump. The Deluxe Overreach Boot features a newly added reinforced strike area made of ripstop Pro Mesh material for extra protection. Photo by Kate Samuels. The Deluxe Overreach Boots are also incredibly lightweight, but almost indestructible. This makes them ideal not only for using while schooling and competing, but for turnout with horses that have a tendency to pull shoes or whack themselves. 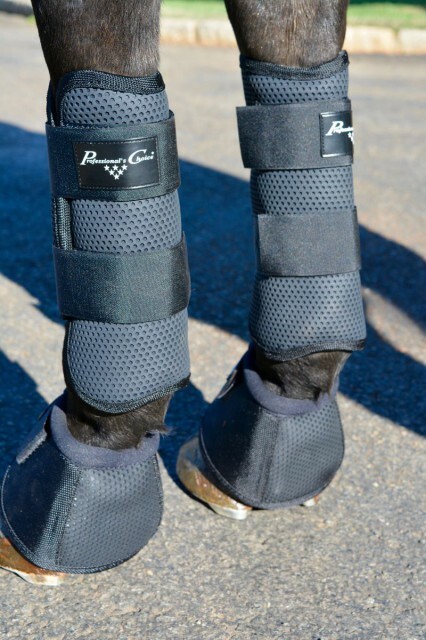 You can rest easy while leaving your darling in the paddock for the night while wearing these overreach boots. Professional’s Choice makes a concerted effort to provide you with high quality products backed by research that won’t break the bank, and these two products are no different. The Pro Performance XC Boots retail separately front and hind for $82.95 and $92.95, respectively. You can get them in either black or white, to suit your cross country colors or just your taste. The Deluxe Overreach Boots retail for $35.95. All of the boots you find at Professional’s Choice come with a 30-day Money Back Guarantee as well as a 6-month warranty, which is a great value, and offers you protection in your purchase.